The Ceciliyan Tea Factory, managed by Ceciliyan Associates Ltd. and situated in Kalawana, Ratnapura, was recently recognised with the Gold award for being an Outstanding Tea Producer at the annual Total Excellence in Tea Production Awards organised by the Tea Exporters Association of Sri Lanka for the year 2018. 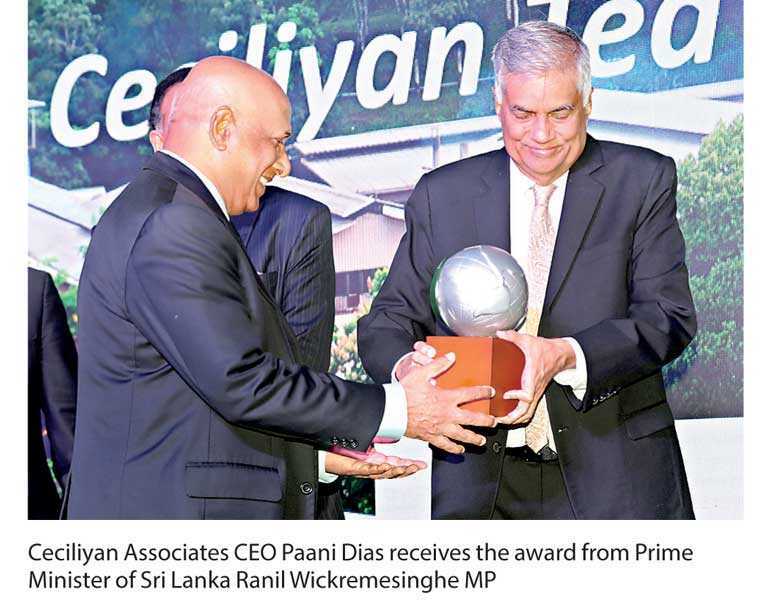 With the award in the “Low Grown” category, Ceciliyan was able to become the overall winner out of 125 tea factories from the Sabaragamuwa region. Ceciliyan was also the first runner-up in the same category in 2017. This track record of excellence is a fitting acknowledgment of the consistent and stringent high standards championed by the factory in the production of superior quality tea. Additionally, Ceciliyan has achieved five all-time record prices for their tea at the auctions as well as being adjudged “Best Entrepreneur of the Year (Sabaragamuwa Province)” in 2017 by the Chamber of Commerce, Sabaragamuwa. Nestled among the hills of Kalawana, adjoining the Sinharaja forest, the largest rainforest in the country, the Ceciliyan estate is in perfect harmony with nature. Tea has been planted on the estate since the early 1920s. Ceciliyan Associates Ltd. is a family-run company, managed by CEO Paani M. Dias, a third generation family member. Under his management, the factory has flourished and now produces 3.5 million kilograms of made tea, by processing green leaf from over 6,500 small holders in the Kalawana area. This can be compared to the original production of less than 5,000 kilograms of made tea a year in the 1980s. The factory has facilities to produce both conventional and CTC teas, depending on market demand. The Ceciliyan Tea Factory is widely regarded as a model factory in Sri Lanka that produces high quality teas. It has also earned many accreditations including the ISO 22000:2005 and Ethical Tea Partnership certificates. While tea continues to play a major role and will always be Ceciliyan’s main business and passion, rubber, cinnamon, coconut and paddy have also been grown in conjunction with tea. This has allowed the cultivation of a diverse ecosystem that does not hinder the natural equilibrium. Ceciliyan takes every measure necessary to make sure that it never disrupts nature, but empowers it. In the past, Ceciliyan has been mainly focused on selling its tea via the Colombo auction. Ceciliyan has started introducing its factory fresh premium quality tea, which is perfect for the discerning Sri Lankan palate, to the local market under the brand name of Ceciliyan Tea. Featuring a strong, rich flavour, with a bright, reddish hue, this tea is truly the epitome of freshness and flavour. In line with Ceciliyan’s finest tea traditions dating back almost 90 years, Ceciliyan Tea is delivered straight from the factory to your cup, and will always remain true to our promise of being naturally the best.